The City of Toronto is proposing to install a bikeway on Argyle Street from Ossington Avenue to Shaw Street. 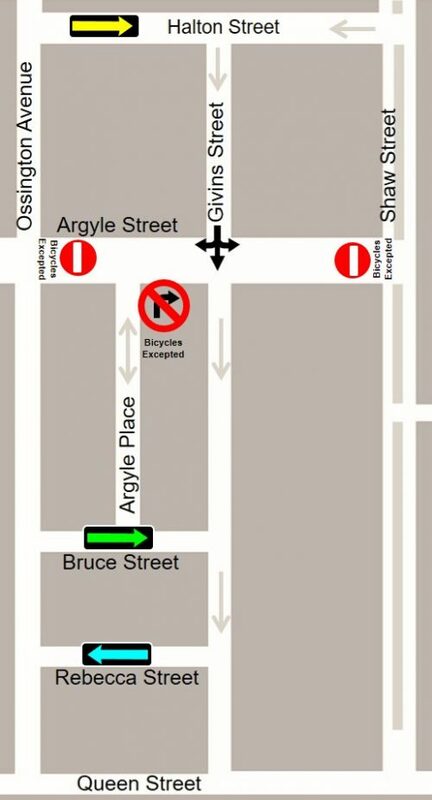 A combination of “contra-flow” bike lanes, shared travel lanes, and a change to the direction of motor vehicle traffic will provide a legal eastbound and westbound bike route on Argyle Street and connect to existing popular bike routes on Shaw Street and Argyle Street west of Ossington Avenue. Changes to the direction of Halton Street, Bruce Street, and Rebecca Street are also proposed to maintain motor vehicles into and out of the neighbourhood. This work is part of the City’s Council-approved Ten-Year Cycling Network Plan to connect, grow and renew infrastructure for cycling routes across the City. We invite you to attend a drop-in consultation event to learn more about the proposal for the Argyle Street Bikeway and speak with staff. If you are unable to attend, the materials will be posted online the day after the meeting. Contact us with any accessibility requests. Date: Tuesday, April 23, 2019. Time: Drop in anytime between 6:30 p.m. and 8:30 p.m.
Sign up by email to receive notifications and updates. Most of Argyle Street has a road width (curb to curb) of 7.2 metres, which allows for one travel lane (shared by motor vehicles and bicycles), one contra-flow bike lane, and on-street parking on one side of the road. This design currently exists west of Ossington. However, the road width between Ossington and Givins is 6.0 metres. The City’s proposal to permit two-way cycling will not remove any on-street parking. Eastbound motor vehicle traffic would be prohibited from entering the block from Ossington and nearly all motor vehicle traffic on this block would be westbound. Ossington Avenue to Givins Street: an eastbound contra-flow bike lane for cyclists only for 15 metres, which becomes a shared travel lane for cyclists and motor vehicles; a westbound shared travel lane for cyclists and motor vehicles. The following changes to traffic flows are required to provide motor vehicles access in and out of the area. The eastbound 15-metre contraflow bike lane at Ossington Avenue only allows cyclist access and prevents eastbound motor vehicle traffic from entering Argyle Street. This will eliminate eastbound traffic infiltration. Motor vehicle traffic will generally travel westbound from Givins Street to Ossington Avenue. Traffic volume on this block is expected to decrease. 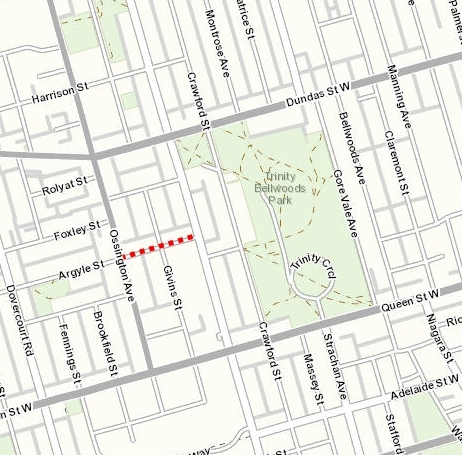 Note: Properties with driveways between Ossington Avenue and Givins Street may turn in both directions. A shared travel lane can be marked with “sharrows” (bicycle markings with chevrons) to identify where cyclists should ride in motor vehicle traffic and remind drivers to share the road. A contra-flow bicycle lane can be installed on a one-way street, which then becomes two-way for bicycles, while remaining one way for motor vehicles.